This article is about the breakaway state that existed from 1960 to 1963. For other uses, see Katanga. The State of Katanga (French: État du Katanga; Swahili: Inchi Ya Katanga), also sometimes denoted as the Republic of Katanga, was a breakaway state that proclaimed its independence from the Republic of Congo-Léopoldville on 11 July 1960 under Moise Tshombe, leader of the local Confédération des associations tribales du Katanga (CONAKAT) political party. The new Katangese state did not enjoy full support throughout the province and was constantly wracked by ethnic strife in its northernmost region. It was dissolved in 1963 following an invasion by United Nations Operation in the Congo (ONUC) forces, and reintegrated with the rest of the country as Katanga Province. The Katangese secession was made with the support of Union Minière du Haut Katanga, a Belgian mining company, and a large contingent of Belgian military advisers. A paramilitary force designated the Katanga Gendarmerie, raised by the Tshombe government, was initially organised and trained by Belgium and subsequently, mercenaries of various nationalities. When the Belgian Congo received independence from Belgium on 30 June 1960, it was already wracked by ethnic factionalism and political tension. A coalition of CONAKAT politicians and Belgian settlers had made an attempt shortly before that date to issue their own declaration of independence in Katanga, but the Belgian government opposed their plans. CONAKAT was especially concerned that the emerging Congolese government under prime minister Patrice Lumumba would dismiss its members from their positions in the Katangese provincial government and replace them with his supporters. On the evening of 11 July, CONAKAT leader Moïse Tshombe, accusing the central government of communist leanings and dictatorial rule, announced that Katanga was seceding from the Congo. When the newly appointed commander of the Élisabethville military garrison arrived in the city, Katangese authorities immediately detained and expelled him. He flew to Luluabourg and informed Lumumba and President Joseph Kasa-Vubu of the secession. The two decided to fly to Katanga for to examine the situation themselves. Katangese Minister of Interior Munongo denied them permission to land at the airport and radioed that while Kasa-Vubu could visit Katanga if he wished, Lumumba was not allowed to enter the territory. Infuriated, the President and Prime Minister returned to Luluabourg. Tshombe immediately appointed his own commander, a Colonel Norbert Muke of the Force Publique, to form a new military force, the Katanga Gendarmerie. The gendarmerie was staffed with Belgian officers who were, in effect, seconded to Tshombe as military advisers. Tshombe and CONAKAT argued that the secession was the result of indigenous nationalist sentiment. However, the Baluba population of the northern districts of the province were actively opposed to independence, and even the population in the south, while generally more sympathetic to Tshombe, was never directly consulted on the matter. Katanga was also home to a disproportionately large white community of Belgian descent, as well as many Belgian expatriates who had invested heavily in the province. For the most part, Katanga's white residents openly backed the secession. Unlike Lumumba, Tshombe had openly courted them, likely because he believed they possessed much needed technical skills, and their exodus would prove catastrophic to the Katangese economy. Within a week of Katanga's unilateral declaration of independence, Lumumba sent a telegram to the Secretary-General of the UN, insisting that something be done about "Belgium's military aggression" in his country and its overt backing of Katangese secession. Lumumba requested "urgent military assistance" due to his government's inability to maintain order in the massive country. Among UN member states, sentiments towards Katanga were generally mixed. The Britain and France remained neutral, the latter quietly hostile towards the very idea of peacekeeping in Congo. The British initially provided general assistance to the UN troops who were eventually dispatched, but refused to cooperate with subsequent efforts to deal with Tshombe's rebellious regime. Portugal and the Union of South Africa were openly hostile towards the operation from its conception, and maintained consistent opposition against any interference with the Katanga state. Gerald-Libois writes: '..during the entire month of August, a ..race against the clock took place with the objective of building a more or less efficient Katangese gendarmery before the eventual withdrawal of the Belgian troops. The commander of the new gendarmery, Major Crèvecoeur, called for former officers of the Force Publique who had left the Congo after the July troubles or were in Katanga.' The numbers of the new force were originally fixed at 1,500 volunteers from 16 to 21 years of age recruited from 'safe' ethnic groups. Almost all the aircraft of the Force Publique had been transferred to Kamina,[clarification needed] then requisitioned by Katanga. On 14 July 1960, in response to requests by Prime Minister Lumumba, the UN Security Council adopted Resolution 143. This called upon Belgium to remove its military personnel from the Congo and for the UN to provide 'military assistance' to the Congolese forces to allow them 'to meet fully their tasks'. Lumumba demanded that Belgium remove its troops immediately, threatening to seek help from the Soviet Union if they did not leave within two days. The UN reacted quickly and established United Nations Operation in the Congo (ONUC). The first UN troops arrived the next day but there was instant disagreement between Lumumba and the UN over the new force's mandate. Because the Congolese army had been in disarray, Lumumba wanted to use the UN peacekeepers to subdue Katanga by force. Referring to the resolution, Lumumba wrote to UN Secretary-General Dag Hammarskjöld, ‘From these texts it is clear that, contrary to your personal interpretation, the UN force may be used to subdue the rebel government of Katanga.’ ONUC refused. To Hammarskjöld, the secession of Katanga was an internal Congolese matter and the UN was forbidden to intervene by Article 2 of the United Nations Charter. A subject of much controversy was Belgium's involvement with Katanga. Brussels had neither inspired nor engineered Moise Tshombe's scheme of Katangese secession, but provided technical, financial, and military aid in order to keep Katanga stable in terms of public order and domestic security. The Belgians went on to advise the ONUC force against unnecessary interventions against the state, as it would only "risk increasing the confusion." At the same time, Pierre Wigny, the Foreign Minister, informed the United States, France, and Britain that his government was opposed to Tshombe's intrigues and was concerned that long-term separation would compromise Congo's economic vitality. Despite the fact that most of Belgium's military personnel were withdrawn from Katanga in September 1960, over two hundred stayed on, making horizontal career shifts into roles as paid mercenaries serving with the nation's Gendarmes. As late as 1963, several of these soldiers of fortune were still at large, having shed their military uniforms for civilian dress. Other notable Belgian nationals who stayed on included political advisers and some diplomatic ministers. Upon the arrival of United Nations forces in the Congo, they were opposed to allowing ONUC freedom of movement in Katanga and insisted upon obstructing the peacekeeping effort. This view was generally strengthened with President Tshombe himself as time advanced, especially with increasingly vocal demands from Léopoldville that the UN use their military advantage to forcibly remove his regime from power. The Security Council, however, only reaffirmed that the ONUC would not be party to any internal disputes but would enter Katanga to assist with keeping the peace. 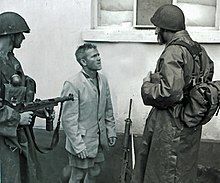 The first such personnel, largely Swedish forces, entered Élisabethville, the Katangese capital city, on 12 August 1960. All of this only frustrated the Congolese government, which, on 27 August, launched a poorly organized, ill-fated, incursion into Katanga with Armée Nationale Congolaise soldiers trucked into the province on a motley assortment of Soviet military vehicles. This incident would only lead to the further deterioration of relations between the two governments; sporadic clashes would continue for the next two years. On 8 November, an Irish Army platoon, sent to repair a bridge in Niemba, was ambushed and nine of its men killed by Baluba tribesmen. Only shortly afterwards, Patrice Lumumba was replaced in a coup d'état by Joseph Mobutu. On 17 January 1961 Mobutu sent Lumumba to Élisabethville where he was tortured and executed shortly after arrival. The United Nations Security Council met in the wake of Lumumba's death in a highly emotional atmosphere charged with anti-colonial feeling and rhetoric. On 21 February 1961, the Council adopted resolution 161, which authorised 'all appropriate measures' to 'prevent the occurrence of civil war in the Congo, including '... the use of force, if necessary, in the last resort'. This resolution demanded the expulsion from the Congo of all Belgian troops and foreign mercenaries but did not explicitly mandate the UN to conduct offensive operations. However, it was ultimately interpreted by the local UN forces to justify military operations in ending the secession of Katanga. Despite the resolution, during the next six months, the UN undertook no major military operations, concentrating instead on facilitating several rounds of political negotiations. However, many sources on location claimed that UN personnel initiated and maintained a high degree of violence and were both overtly and indirectly responsible for hundreds if not even thousands of civilian deaths. From late 1960 onwards, Katanga was characterised by a series of clashes between pro-Tshombe loyalists and Baluba tribesmen, whose political leaders were nominally allied to Leopoldville and opposed Katangese secession. Smaller battles were fought against ANC units attacking from other provinces, as well. Sparsely deployed and on many occasions even outgunned by both sides, UN forces had an almost hopeless task of attempting to prevent outright civil war. Anticipating the need for continued ONUC presence in the state, the Security Council authorized an increased presence in Élisabethville. By mid-1961, however, presidential security forces had killed almost 7,000 Balubas. Factional strife also began to engulf the struggling regime. Increased numbers of peacekeepers only enraged the Baluba people, who viewed the United Nations as an unwanted intruder and began attacking both Katangese and UN soldiers with little discrimination. In February 1961, attempting to bolster his position in Katanga, Moise Tshombe began importing more foreign mercenaries from neighboring states to assist his Gendarmes. The "Mercenary Problem", as the international community termed it, was a major concern of the ONUC. The Katangese Army was already staffed by Belgian officers, and white volunteers of Belgian extraction constituted about 117 men under Tshombe's direction. Although from January to February 1961, gestures were made to remove these 'illegal combatants' from the Congo, their places were quickly taken by a sizable force of nearly 500 British, Rhodesian, French, and South African irregulars. Many of them were given command assignments in the Gendarmes, while others formed a pro-Tshombe unit known as the "International Company", composed chiefly of white South African fighters. Especially notable among the French mercenaries were professional career soldiers who had fought in the Algerian War. Several were the heads of a para commando training program in Katanga. On March 30, one of the first public reports mentioning large contingents of foreign soldiers claimed that the mercenaries in Katanga included "Belgians, Italians, and 100 South Africans". Serious fighting soon broke out as President Tshombe began to incite both Katangese civilians and white mercenaries to attack UN forces after the ONUC dispatched elements of the nearly 5,000 man-strong 99th Indian Infantry Brigade into the capital. On 5 April 1961, the Secretary-General criticised Belgian mercenaries for their service in Katanga and condemned Tshombe for turning the Katangese public against the United Nations Force. Hostilities broke out again three days later, when Belgian and South African Gendarmes assaulted Kabalo, a Baluba town in northern Katanga, and engaged the Ethiopian peacekeepers stationed there. In the battle that followed, at least 30 mercenaries were disarmed and captured. It was not until 30 April that the State of Katanga agreed to cease hostilities against the ONUC. In June, President Tshombe was arrested after attending the Coquilhatville Conference of Congo Leaders, the day he was about to board a plane back to his country. He was held under house arrest and charged with inciting revolt against the Congolese government, the illegal seizure of arms and aircraft, and printing counterfeit money by issuing a Katangese currency. Tshombe subsequently signed a pledge to reunite Katanga with the rest of the nation, and was released accordingly. However, by August it was clear he had no intention of implementing this agreement. Tshombe openly declared in a speech that month that he would defend Katanga's rights as a sovereign state and would do everything to maintain this status quo even in the face of all opposition. In August and September, the UN conducted two operations to arrest and repatriate mercenary soldiers and the Belgian political advisers from Katanga by military force, deeming that such foreigners were the backbone behind the regime. The first operation was carried out by Indian UNF troops, who began rounding up mercenaries at 5 am, culminating in the bloodless capture of nearly 400 men. Not a single shot had been fired. Although Belgium's consul in Katanga was ordered to deport the remaining Belgian nationals, including political advisers, he countered that he could only exercise legal authority over those who were official staff affiliated with his nation's government or military. Altogether, about 300 of those captured were expelled from Congo, although several of the mercenaries later returned. White Katangese especially resented this action by the UN. Tshombe was taken by surprise, and tensions escalated rapidly. On 11 September, the UNF further demanded that all foreigners serving as police officers in Katanga be expelled, but the president did not comply. Any chances of negotiation for the peaceful removal of remaining foreign players was quickly crushed by the revelation that some UN personnel had been planning to aid in a conspiracy to remove Tshombe from power, seize the radio station in Élisabethville, and apprehend his Gendarmes. The Katangese quickly unearthed the plot, and when Tshombe confronted the UN with his charges it was revealed, much to the latter's embarrassment, that these allegations were based on fairly solid evidence. If such an incident had been allowed to take place, it would clearly have been considered a violation of the ONUC's vows to remain neutral in internal issues besides taking proper action to prevent a major conflict. The following day, hostilities reopened after 155 Irish soldiers protecting civilians in Jadotville were surrounded by a superior force of Gendarmes, including many Europeans. Despite suffering several attacks launched by Katanga's mercenary-piloted Air Force in support of the Gendarme unit, the troopers refused to surrender and during the ensuing fighting inflicted heavy casualties on the attacking forces. No longer able to take the increasing violence in Katanga, the ONUC commanders finally agreed to a new plan which would remove the Katangese government from power. It called for UNF troops to apprehend mercenaries, seize post offices and radio stations in Élisabethville, and send a representative from the central Congolese government to take command. This attempt was not at all bloodless and was resisted by the Gendarmes and their mercenary allies. The initial UN initiative to take over the post offices was efficiently repulsed. Later that day, Katangese soldiers launched a coordinated attack on ONUC forces. An eight-day battle was waged in the city, resulting in the deaths of 11 UN personnel. One company of Irish troops, at Jadotville, were captured. Tshombe's army enjoyed unchallenged air power, and the tiny Katangese Air Force carried out successful strafing and bombing runs on UN positions entrenched in Jadotville, Élisabethville, and Kamina. The dismal failure of the UNF could also be attributed to inferior equipment. While the Gendarmes were armed with automatic rifles, heavy machine guns, mortars, and Greyhound armored cars, the vast majority of UN troopers used antiquated rifles and civilian vehicles plated with only makeshift protection. During the fighting, the Katangese authorities offered a conditional ceasefire, which was immediately rejected by the ONUC. Eventually, it became clear that any objective to depose Moise Tshombe had failed. The British, Belgian, and French governments became especially critical of 'peacekeeping operations' in Congo which would involve such interference in domestic affairs. They called for an immediate ceasefire. The Soviet Union, on the other hand, protested that more force should have been used to subdue Katanga and initiate an immediate reunification with the Mobutu government. In the course of the limited peace negotiations which ensued, UN Secretary-General Dag Hammarskjöld and 15 others were killed in a plane crash near Ndola, Northern Rhodesia (now Zambia), under questionable circumstances. There is some evidence that suggests the plane was shot down. Hammarskjöld's death set off a succession crisis at the United Nations, as there was no line of succession and the Security Council had to vote on a successor. Under UN pressure (military attacks), Tshombe later agreed to a three-stage plan from the new acting Secretary General, U Thant, which would have reunited Katanga with Congo. However, this remained an agreement on paper only. The Katangese government insisted that should the plan in full be honored by Leopoldville, Tshombe be entitled to aid in drafting a new Congolese constitution and elect his own representatives to Parliament. However, both sides began to express reservations about the terms less than a week later. The president wished that his agreement should be ratified by his national assembly before it could be considered binding; this misunderstanding quickly led to a collapse in relations with Congolese government of Prime Minister Cyrille Adoula. The frustrated United Nations went on to adopt a new plan, one that called for the adoption of a federal constitution in Congo within thirty days, an end to the illegal Katangese rebellion, the unification of currency, and the sharing of mining revenues on a fifty-fifty split between Katanga and the central government. U Thant, who was the chief architect of this proposal, also demanded that Tshombe unconditionally release all of his political prisoners. Belgium and the United States, hoping that the latter would have a positive role in reforming a unified Congo, endorsed the plan. While Cyrille Adoula immediately accepted this compromise, Moise Tshombe stipulated conditions. A series of discussions hosted by the UN followed although it failed to yield tangible results. Thant, who had become increasingly incensed by what he regarded as the Katangese state stalling for time, imposed economic sanctions. This, however, only succeeded in destroying the last hopes the Secretary-General had for a peaceful integration. On December 19, an exasperated Tshombe withdrew from ongoing negotiations in protest. Red Cross hospital bombarded by UN forces during Operation Unokat, 1962. As 1962 drew to a close, the United Nations gradually increased its operational strength in Katanga, with Thant considering ever more seriously the option of forcibly ending Tshombe's secession. As UNF forces continued to be harassed by Gendarmerie, the political stalemate rapidly escalated into outright military tension. When the Katangese populace celebrated the anniversary of their independence, for example, UN officials blocked the roads into Élisabethville, fearful of the 2,000-strong "honour guard" that was scheduled to march in upcoming parades. Several thousand civilian residents promptly demonstrated against this unilateral action. Two months later, the local authorities impounded several railroad cars bearing equipment and supplies for use in ONUC operations and a number of Gurkha peacekeepers were wounded by unmarked land mines on the Katangese border. A subsequent report compiled by the Brookings Institution indicated that the Katangese regime was purchasing new military aircraft and increasing the size of its army, reporting that they now had at their disposal "40,000 troops and Gendarmerie, at least 400 mercenaries and at least 20 planes." These figures were exaggerated. The Secretary-General's office responded by increasing trade sanctions, but several member states, the United Kingdom in particular, continued to oppose the use of embargoes to force a political solution. On 20 December, the American State Department announced it would be sending a US military mission to Katanga, a move that was severely criticised by white and black Katangese alike. At least a hundred local students, many of them European, subsequently protested at the United States consulate. The Congolese government and the Eastern Bloc also voiced their dissent. But it soon became apparent that Katanga's bid for international recognition was doomed; skyrocketing pressure for direct action, growing American interests, the militant mood of the UNF commanders, and Belgium's pledge to cease supporting a rebel government all suggested that soon the United Nations would take more forceful measures against Moise Tshombe in the near future. On 24 December 1962, United Nations forces and Katangese Gendarmes clashed near a UNF observation post near Élisabethville. A helicopter was subsequently shot down, and President Tshombe expressed regrets over what initially appeared to be a misunderstanding, promising to call off his forces. But by 27 December, the firing on both sides had not ceased; UN officers notified the National Assembly that they would take all necessary action in self-defense unless a ceasefire was observed immediately. Operation Grandslam was launched the following day and peacekeepers marched on Élisabethville to neutralize the Gendarmes. Swedish troops clear Kaminaville of Katangese resistance, 31 December 1962. Within three days, Élisabethville was under UN control. A number of Gendarmes were either captured or forced to withdraw further west. The foreign mercenaries scattered. Fighter aircraft conducted over seventy sorties against the Katangese Air Force; all but two jets were destroyed on the ground. Tshombe escaped his capital but threatened to launch a counteroffensive unless the UNF restrained itself and called off its attack. A truce was observed until January 1, but, in a controversial act of defiance, UN personnel explicitly ignored their orders from New York and assaulted Jadotville. Katangese forces demolished the bridges over the Lufira River to prevent them from proceeding, but the latter was able to cross using debris, despite light resistance and sporadic sniper fire. It was later suggested that this was due to the slow state of communications then plaguing ONUC in Katanga and the Congo at large. The subsequent capture of Jadotville prevented Tshombe's loyalists from making a stand there, as had been feared. After the fall of Jadotville, several controversial incidents occurred involving UN forces and innocent civilians. Two Belgian women in a car were killed at a road checkpoint after being fired upon by its Indian guards. There were other civilian casualties, including two more unidentified Europeans, who died as a result of actions taken by the UNF. Following these incidents, U Thant suspended further military operations while Belgian and British officials opened up discussions with Tshombe and attempted to talk him into capitulating. It became clear that he was running desperately short of time. On 11 January, peacekeepers entered Sakania, near the Rhodesian border. The Katangese Gendarmes had already been routed and failed to pose a serious threat. Remaining mercenaries, mostly Frenchmen and South Africans, were unable to provide any effective leadership. They ignored instructions to follow a "scorched earth" policy and fled the country by way of Angola. On 15 January, Moise Tshombe conceded defeat and allowed UN officials into Kolwezi on 21 January, his last stronghold. Land mines and demolitions were to be removed, and all armed loyalists directed to surrender their weapons. Tshombe reportedly claimed in a final address to his supporters: "For the last two and a half years you have twice fought heroically against the enemy. Now their superiority has become overwhelming." The Congolese government took immediate steps to reintegrate Katanga with the rest of the country. Gendarmes were absorbed into the national military, and Joseph Ileo, former Prime Minister, was appointed Resident Minister of the new province. The United Nations provided assistance in reuniting divided economic and administrative divisions. On 29 January, the Secretary-General's office stated that most UN action in the former state would be limited to economics and that a substantially reduced force would be maintained to keep order. Denmark, Ghana, and the Philippines each pledged to dispatch more personnel. U Thant also called for a slow reduction of military presence, in case a second secession was attempted by fanatics or diehards. Although he defended the use of force taken by ONUC in ousting Tshombe, he also commented regarding the final campaign, "For a peace force, even a little fighting is too much, and only a few casualties are too many." In July 1964, Moise Tshombe returned from exile to become Prime Minister of Congo at the head of a coalition government, succeeding Cyrille Adoula. He was dismissed from his position in October 1965. Wikimedia Commons has media related to State of Katanga. ^ "Katanga – nationalanthems.info". Retrieved 21 August 2018. ^ a b c Mockler, Antony (1987). The New Mercenaries: The History of the Hired Soldier from the Congo to the Seychelles. New York: Paragon House Publishers. pp. 37–55. ISBN 0-913729-72-8. ^ For more on the Gendarmerie, see Jules Gérard-Libois, 'Katanga Secession,' University of Wisconsin Press, 1966, 114–115, 155–174. ^ Hoskyns 1965, p. 140. ^ Hoskyns 1965, p. 99. ^ Hoskyns 1965, p. 100. ^ a b c d e f g h i j k l m n o p q r s t u v w x y z aa Lefever, Ernest W., ed. (1965). Crisis in Congo: A United Nations Force in Action (1st ed.). Washington DC: Brookings Institution. ISBN 0-8157-5198-2. ^ Gerald-Libois, 'Katanga Secession,' 1966, 114. ^ "The UN in the Congo". Keith Kyle. Archived from the original on April 18, 2005. Retrieved September 12, 2006. ^ "Security Council Resolutions 1960". United nations. Retrieved September 20, 2006. ^ "Letters from Niemba: Irish troops in the Congo, 1960", History Ireland, Issue 6 (Nov/Dec 2010), Volume 18. ^ "Moïse Kapenda Tshombe Biography". BookRags, Inc. Retrieved June 29, 2011. ^ James 1996, p. 193. ^ Mockaitis 1999, p. 38. ^ Daniel & Hayes 2016, pp. 215–216. Daniel, Donald C.; Hayes, Bradd C. (2016). Beyond Traditional Peacekeeping. Springer. p. 320. ISBN 978-1-349-23855-2. Devlin, L. (2007) Chief of Station, Congo: Fighting the Cold War in a Hot Zone, New York, Public Affairs, ISBN 1-58648-405-2. Epstein, H. (ed). (1974) Revolt in the Congo, 1960–1964, Armor Books. Essays by various authors. Gondola, C.D. (2002) The History of Congo, Greenwood Press, ISBN 0-313-31696-1. Jackson, H.F. (1982), From the Congo to Soweto, U.S. Foreign Policy towards Africa since 1960, New York, McNally & Loftin Publishers, ISBN 0-688-01626-X. James, Alan (1996). Britain and the Congo Crisis, 1960–63. Springer. p. 219. ISBN 978-1-349-24528-4. Kalb, M.G. (1982), The Congo Cables: The Cold War in Africa – From Eisenhower to Kennedy, New York, Macmillan Publishing Company, ISBN 0-02-560620-4. Kestergat, J. (1986) Du Congo de Lumumba au Zaïre de Mobutu, Brussels, P. Legrain, ISBN 2-87057-011-2. Lemarchand, René (1964) Political Awakening in the Belgian Congo, University of California Press. Mahoney, R.D. (1983) JFK: Ordeal in Africa, New York, Oxford University Press, ISBN 0-19-503341-8. Meredith, Martin (2005) The State of Africa: A History of Fifty Years Since Independence, The Free Press, ISBN 978-0-7432-3222-7. Mockaitis, Thomas R. (1999). Peace Operations and Intrastate Conflict: The Sword Or the Olive Branch?. Greenwood. p. 166. ISBN 978-0-275-96173-2. Vaqué, Klaus D. (1989). The Plot Against South Africa. Varama. p. 244. ISBN 978-0-620-14537-4. Crellin, Zac (August 4, 2016). "The conspiracy of Katangese nationalism". Fahamu. Pambazuka News. Gérard-Libois, J. (1963) Sécession au Katanga, Brussels, Centre de Recherche et d'Information Socio-Politiques. Larmer, Miles and Kennes, Erik (2014) "Rethinking the Katangese Secession" in Journal of Imperial and Commonwealth History, pp. 1–21. Erik Kennes and Miles Larmer, The Katangese Gendarmes and War in Central Africa: Fighting their Way Home, Bloomington, IN: Indiana University Press, 2016. Yakemtchouk, Romain (1988). Aux origines du séparatisme katangais. Brussels: Académie royale des sciences d'outre-mer. OCLC 19371066.